200 Tickets Available for USGBC Texas Gulf Coast Region Members! August 15-16th: BUILDexpo Houston Houston’s Largest Building and Construction Show at NRG Park The USGBC Texas Gulf Coast Region is invited to the 15th annual BUILDexpo event on August 15-16, 2018 at NRG Park. If you are interested in volunteering some time for the USGBC Texas Gulf Coast booth, please contact Maria Perez maria_perez@gensler.com. 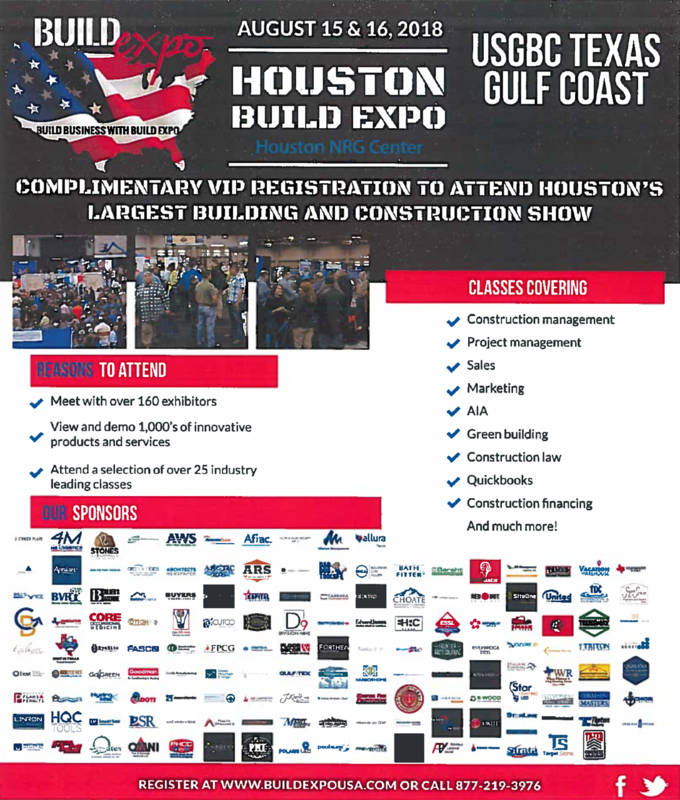 More information about BUILDexpo Houston: Build Expo features over 150 exhibitors, over 30 complimentary educational classes and will have between 2,000-2,500 attendees over the two days.